Manufacturers Midway - Come check out your favorite displays in Nitro Alley from 1:30 P.M. until the beginning of the second Nitro qualifying session. Nitro Qualifying - Catch the action of two sessions of 300 MPH Nitro qualifying - 6:00 P.M. & 8:30 P.M.
Jet Cars - After Nitro qualifying, stick around to see our spectacular Douthit Motorsports eye lighting Black Pearl Jet Funny Car vs. Pro Jet Motorsports Al Z's Hot Blade Jet Dragster! Known for their exciting pre-run flame shows and after burner pops, jet cars are thrust driven vehicles propelled by jet engines! Manufacturers Midway - Come check out your favorite displays in Nitro Alley from 11:45 A.M. until the beginning of the fourth Nitro qualifying session. Nitro Qualifying - Catch the action of two sessions of 10,000 horsepower Nitro Qualifying, the pro drivers last chance to make it into the top 16 for Race Day - 4:00 P.M. & 6:45 P.M.
Nitro School – Come join Alan Reinhart and T.J. Zizzo at the NHRA Midway Display and get schooled on all your Nitro knowledge - 1:15 P.M.
Mello Yello and Route 66 Champions Q&A and Autograph Session - At the Mello Yello display featuring your favorite NHRA Mello Yello Drag Racers and past Route 66 Raceway Champions including Tom McEwen, Arnie Beswick, Gary Dyer, John Force, Tony Schumacher, Antron Brown, Alexis Dejoria and Connie Kalitta - 1:45 P.M.
Chicago Racers Review - Reflection on the past 20 years with your hometown Drivers at the 20th Annual Midway Display featuring Tony Schumacher, Don Schumacher, Arnie Beswick and many more! - 9:30 A.M.
Sealmaster Trackwalk - Join us in walking the track at Route 66 Raceway with a few of our special guests. 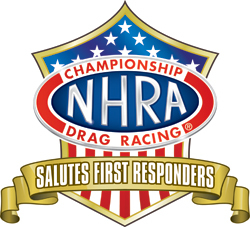 As part of the tribute, first responders will be eligible for discounted tickets to the Fallen Patriots NHRA Route 66 Nationals presented by K&N Filters through SheerID. Click here to purchase.